Dr. Dan Rairigh and our team like to put most of our energy in prevention, because avoiding a cavity is much better for your smile’s long-term health and appearance than simply fixing it later. This why we are happy to offer checkups and cleanings in addition to many other services that can stop many dental problems before they even start. We recommend coming to see us at least twice a year to keep your smile happy and healthy. To schedule an appointment, please contact us today. 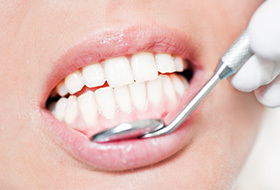 When it comes to stopping tooth decay, cavities, gum disease, and other common dental problems in their tracks, nothing works better than a checkup and cleaning. Just two of these every year can make a huge difference for your overall oral health over time, and typically, these appointments take less than an hour. One of our hygienists will systematically remove all of the plaque and tartar that has accumulated on your gums. 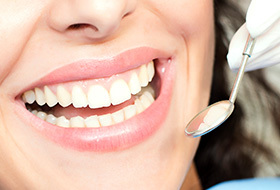 They’ll specifically target the areas of your mouth that you can’t clean at home and then finish the visit with a nice teeth polishing so that you leave with your teeth feeling porcelain-smooth! During a checkup (also known as an oral exam), Dr. Rairigh will examine each of your teeth, your gums, the jaw, and any existing dental work to try and identify the earliest sign of a problem. If he catches an issue, he will share his recommendations to treat the concern before it grows into a large problem. Periodontal therapy is a collection of treatments designed to help patients who are dealing with periodontal disease. What is periodontal disease? It is actually a bacterial infection of the gums, the roots of the teeth, and the bone that supports it. It is more commonly called gum disease, and it is actually the most prevalent dental problem in the entire world. Early symptoms include red, swollen gums that bleed easily, but left untreated, it can often lead to tooth loss! This is why our team will screen your gums whenever you come to see us. If we see signs of an infection, we can quickly perform a deep cleaning to control it. This will remove all the bacteria around your gum line as well as slightly reshape the roots of your teeth to make re-infection less likely. We can then follow this treatment up with antibiotic therapy to completely eliminate the infection as well as offer treatments to reverse gum recession. Research has shown that as many as 1 in 3 people currently suffer from bruxism, which is a condition where a person clenches and grinds their teeth while they sleep. This can severely wear down the enamel, making the teeth more sensitive and brittle until they finally break. 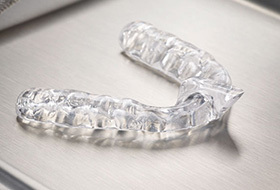 If you are currently dealing with bruxism, we recommend that you wear what is called a “Night Guard” to bed. It is a custom-made mouthpiece that will place a protective barrier between your teeth so you can rest easy. Oral cancer is an often fatal disease that is actually very treatable when detected early, which is why Dr. Rairigh recommends that every adult should have at least one oral cancer screening per year. He can perform one as part of your regular checkups, during which he’ll examine your lips, gums, tongue, cheeks, throat, neck, and face for any signs of the disease. Should he find something, he can help you quickly get follow-up treatment. Fluoride is a mineral that has long been shown to strengthen the teeth against both decay and cavities, which is why you’ll so often find it in both toothpaste and public water sources. You will also find it in our office! We can provide you with a professional fluoride treatment as part of your regular checkups to give you a little bit more cavity protection between appointments. It only takes a few minutes, is completely painless, and it will help keep your teeth healthy until we can see you again!